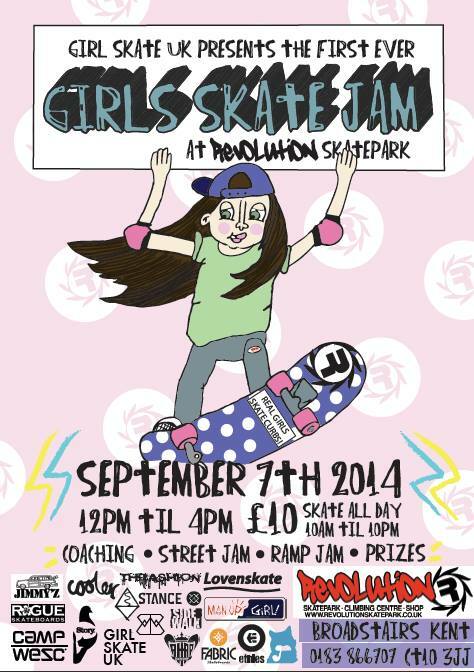 Girl Skate UK is pleased to announce Revolution Skateparks first ever Girls Skate Jam! Join us on Sunday 7th September 2014 for a girls only session from 12pm until 4pm, for just £10 you can skate ALL DAY from 10am until 8pm! Revolution is a huge indoor skate park in Broadstairs, Kent. There will be informal competitions with LOADS of prizes up for grabs! Sponsors include Rogue Skateboards, Milk Skateboards, Fabric Skateboards, Sidewalk Mag, Etnies, Lovenskate, Camp WeSC, Story Clothing, Jimmy’z, Man Up Girl! Brahboys, Stance Socks, Thrashion, Roam & Seek, Altar Skate Shop & more!! Please help us to spread the word!